PicaJet Photo Manager helps you automatically manage 1000s of your digital photos in seconds. 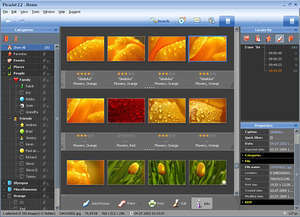 Additional features include built-in tools to keep your photos safe, an image search engine with support for EXIF data, a slideshow maker and a simple and easily navigable tool to generate a web gallery from templates. If you have a large photo collection and need an efficient way to deal with and organize it, this is the software you'll want. For security reasons, you should also check out the PicaJet Photo Organizer download at LO4D.com which includes virus and malware tests. Additional screenshots of this application download may be available, too.